NO CALL-OUT FEE IN THE CBD...just great city service! At Sydney CBD Plumbing there is no job that is too difficult or too small. From a leaking tap/toilet to a burst water pipe or new bathroom/kitchen installation, Sydney CBD Plumbing is ready to service your every need at short notice. We know how important it is to have your plumbing in working order at all times. Sydney CBD Plumbing's Pitt Street location allows us to offer an efficient and reliable city plumbing service. This includes all CBD Residential and Commercial buildings in the City of Sydney. Sydney CBD Plumbing makes ever effort to get the EMERGENCY work done as a priority. I just had Sydney CBD Plumbing come out and visit my apartment at 45 Shelley St, for what we initially thought was a total Toilet replacement (expected cost over $2,000). For Parts & Labour it was just under $200, and their honesty saved me a couple of thousand bucks on a toilet replacement. Great job Matt! cheers, Blair. Sydney CBD Plumbing was wonderful. Both their office and Andrew was very professional. Rory came early next morning and gave me a quote that was very reasonable. He definitely knew what he was doing. Very efficient indeed. Completed the job in one hour which many many other plumbers said it was too complicated. 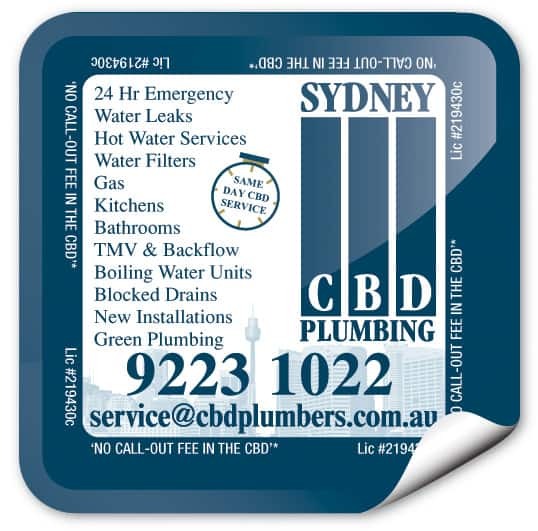 Go on, give Sydney CBD Plumbing a try! My office had a problem with one of the toilets and, so I called the team at Sydney CBD Plumbing. Not only did they answer the phone with manners, but they understood what I was going through and reassured me that they could come out very shortly to fix the problem. They did just that and in a very professional manner too. I had needed to get my old toilet repaired / replaced at fairly short notice. Andrew heard my need, and was extremely accomodating. In the same day, he came out and measured my toilet in preparation of ordering the replacement (because it was an extremely old toilet, replacement was a similar cost). The toilet was replaced with surgical precision the following day, which was no simple feat as it was one of the old toilets concreted in. In fact, when I first came back to my unit to check the work, I was annoyed because my place was so clean I assumed that the work had not been done. But, in fact not only was the toilet perfectly replaced with a brand new one, but I was shocked at how no mess was made whatsoever! I would highly recommend these guys - they are a crack team. They turned over my job in under 24 hours, and really made me feel like they cared about me and wanted to help sort out my problems. Obnoxious and rude, did not show up on the day, and quoted labour at three times the cost of what I ultimately paid another plumber to do. Try A W Edwards - friendly, efficient, and they don't try to rip you off like these guys. Thank you for your comments, we never overprice our jobs as we only service the city area and are highly competitive in the CBD. "Three times more" quoted as you state, referring to another plumbing company is not believable to anyone. We are transparent in our hourly rate and we (don't charge a call-out FEE) so I'm not sure that we did actually give you bad pricing or if you are mistaking us for another company. Either way you can call our office anytime on 9223 1022 for great service. With Regards.